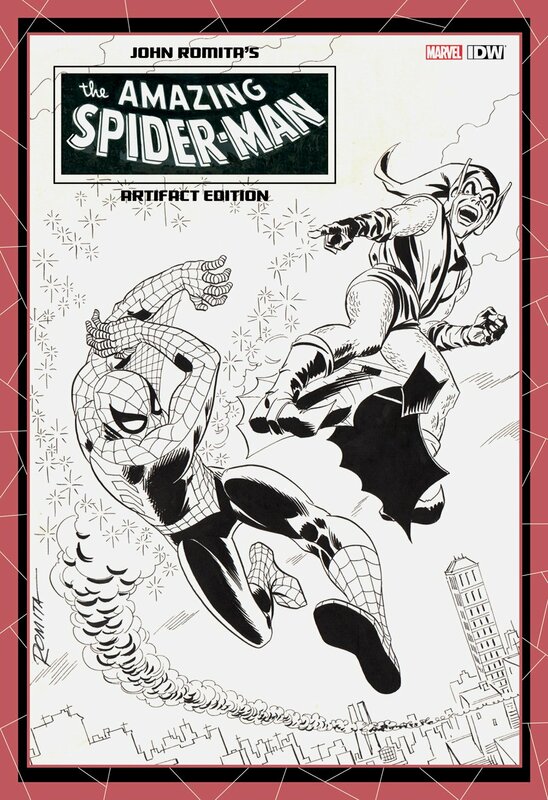 Click Here To See IDW John Romita Artifact Edition Book! Click Here To See Published 1960s Ad In ALL MARVEL COMIC BOOKS! What you are witnessing here is the largest, and arguably the GREATEST Silver Age Spider-Man / Green Goblin LARGE ART battle images ever drawn by the great John Romita! RARE is an understatement for this historic piece right here! 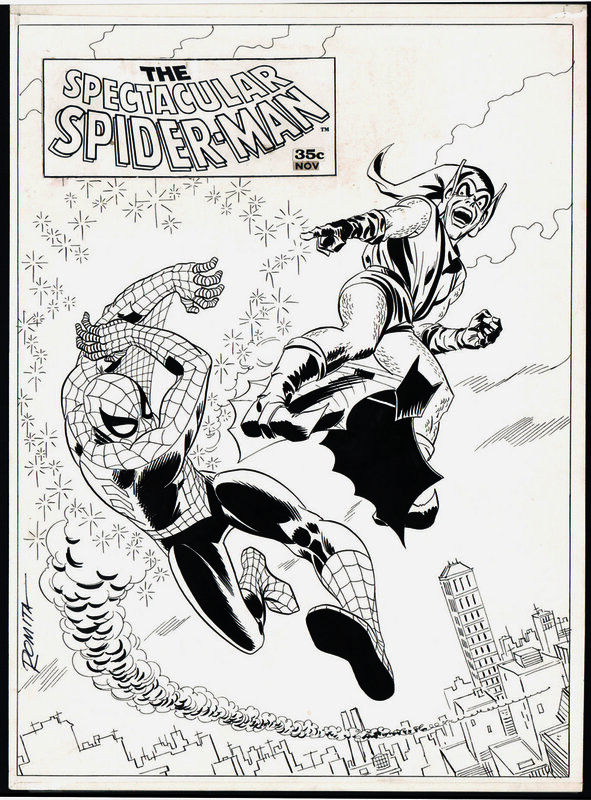 This piece is the ONLY 1960's Large art penciled and inked images ever created by the great John Romita that feature Spider-Man AND the Green Goblin in all out battle where both the hero and villain are prominently shown together battling! (The ASM 39 cover has no Spiderman drawn on it and the ASM 40 cover features the Green Goblin on his hands and knees with his head down and his face not even shown!) And both splash pages to ASM 39-40 books do not have both characters pictured together in full costume, much less with any battle action, such as with this masterpiece! This cover quality image was originally drawn to be the Silver Age cover to The Spectacular Spider-Man #2 Magazine. It still has the original 1960's Stat logo AND the original 35 cent price tag stat still attached to the cover art. This great piece was ultimately replaced by a painting for the Spectacular Spiderman #2 Magazine to promote higher sales since the book went to color art for issue #2. This great image was instead published as a FULL PAGE PINUP in EVERY MARVEL comic book in 1968 to "promote" the Spectacular Spider-Man #2 Magazine. (Click the red link above to see this published image used in Every Marvel comic book in 1968) A very similar image was modified and used again for The Amazing Spider-Man Annual #9 cover in 1973. This great image was so highly thought of that is was used AGAIN a 3rd time, as the FRONT COVER for the IDW John Romita ARTIFACT EDITION book, which was a highly sought after IDW book showing all of Jazzy John Romita's Greatest, LARGE sized covers, splashes, and pages from John Romita's Amazing Spider-Man #39-53 run of LARGE ART pages! (Click the red link above to see this published cover image) The actual drawn image area is quite large, measuring 12 3/4 by 17 3/8 inches tall with art drawn from edge to edge, and the awesome Spider-Man image alone measures 11.25 inches in size! WOW! The actual art image area is larger than nearly all drawn Silver Age Marvel covers from the Silver Age as the STAT logo area on most covers take up the top 5-6 inches on a 13 by 20 inch Marvel cover art board, but not on this beauty, with the art drawn from bottom to top and side to side. THIS TWICE UP Spider-Man / Goblin all out battle image has no white out to speak of, and again, the logo stat is original from 1968. The ASM 39 or 40 covers are locked in private collections as are "EVERY" large art Amazing Spider-Man cover that is known to exist......The ASM 39 or 40 GOBLIN covers would sell for upwards of 600k+ at auction....... So why not get an even BETTER Spider-Man / Green Goblin 1960s silver Age battle cover image for LESS THAN 1/3 of those prices WITHOUT having to worry about how much higher it might sell for at auction? This one-of-a-kind piece of Marvel history should be in a museum.....But you can add this gem to your private collection right now! ALL art on our website (including this one) are able to be purchased with VERY fair time payments, and trades are always considered towards "ANY" art on our website! Just send us an email to mikeburkey@aol.com and we can try to work something out.